After developing the V-1 flying bomb (a.k.a. the doodlebug) a new flying bomb was then developed by German scientists and engineers at the Peenemunde research station on a deadlier version known as the V-2 flying bomb. The V-2 carried the same one ton warhead but was designed to be unstoppable. The doodlebug was an effective weapon, but defences were put up by England in Operation Crossbow that had some success in stopping a good number of doodlebugs getting through. For instance, fast planes were used to intercept the doodlebugs, somtimes even tipping the wings of the doodlebug to topple it. Also, ground gun defences became more and more efficient through evolving technology in stopping the V-1s. The way they made the V-2 flying bomb virtually unstoppable was to enable the flying bomb to travel at supersonic speeds at an altitude of up to 50 miles. From September 1994 around 3,000 V-2 rockets were launched at London and allied targets with around 2,700 people killed and around 6000 people injured. However, forced labour in concentration camps producing these rockets killed even more people. An estimated 12,000 people in concentration camps died through forced labour on the V-2 mass production project. Supersonic speeds were not a new innovation as such, as rifle projectiles travel faster than the speed of sound. However, the V-2 rockets certainly did make their mark on influencing innovations for future supersonic aircraft. Where the V-2 rockets made their mark as in early innovation leading up to launching satellites and space craft into space because it was the first rocket that could achieve the altitude needed to enter space. Nazi propaganda claimed that the V-2 flying bomb was retaliation for the German cities that were being bombed from 1942 until Germany surrendered. The V-2 rockets had external rudders, four in all, located on the tail fins that guided the bombs. The V-2s were mostly painted in a camouflage pattern, with later V-2s being painted an olive green colour. As well as London being targeted, around 1,664 were aimed at belgium and 76 aimed at France with a devastating 2 ton warhead. British intelligence came up with the idea of leaking false information that implied that the rockets were overshooting London by 10-20 miles. Surprisingly, this tactic had an effect as the V-2 rockets were then re-calibrated and ended up falling on Kent. The speed of the V-2 flying bombs was so fast that anti-aircraft guns on the ground didn’t have a chance at shooting them down. Dropping from an altitude of around 100 kms at four times the speed of sound, the V-2 rocket was deemed as almost impossible to stop by operations research teams. The only way that Britain could halt the onslaught of the V-2 rocket attacks was to zero in on the launch infrastructure. Countermeasures against the launch facilities for the V-2 only resulted in them being placed further back, however. The V-2 rocket attack campaign was very expensive and heavy on German resources. A third of Germany’s fuel alcohol production stocks were used and involved using 20 tonnes of potatoes in order to distil the fuel needed for the rockets. In fact, the V-1 doodlebug and V-2 flying bomb campaign cost $3 billion to put into operation. There was also a lack of explosives that could be produced in time, so concrete was sometimes used inside the warhead and sometimes even cramming the warhead with propaganda photographs of German citizens who were dying due to Allied bombing runs. Although the V-2 rockets were used in warfare, causing catastrophic damage, there is a positive side to the V-2 being innovated. 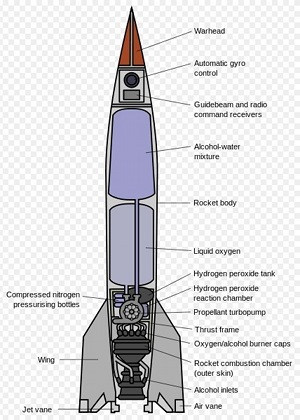 When Allied troops captured the plans for the V-2 rocket it influenced the next 50 years of military rocket ballistics and space flight research. Just think, if it weren’t for the V-2 flying bomb being produced, we may have seen people landing on the moon in the 80s instead of the 60s. With the war long over and the Nazi party eliminated, you have to hand it to the Germans for their innovations in science and engineering, which continue now in modern day peaceful Germany. German engineering is undoubtably still the best in the world.